Milder in flavour than yellowfin tuna with a firm meaty texture. Pan fry in just 6 mins. 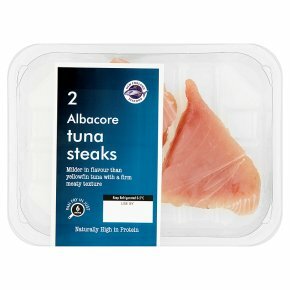 Naturally high in protein.Albacore tuna naturally varies from cream to blush pink colour. There may be some small naturally occurring capillaries which will not affect the eating quality. Serving Suggestion: Finish off with a splash of soy sauce and a squeeze of lime. Garnish with fresh coriander. WARNING: Although every care has been taken to remove bones; small bones may remain. Size and thickness of fish may vary, cook times are given as a guidance.Remove all packaging.Heat 1tbsp of oil in a frying pan over a medium heat.Pan fry the albacore tune for 6-8 minutes turning hallway through.Do not reheat.